With only two more performances remaining in the run of Petite Opera's new Chicago premiere, we continue our series on the Making of a Chicago Premiere. In our last post, we noted that creating a Chicago Premiere involves some careful selection to make certain the "recipe" is just right, and discussed selecting the right version. Now, we'll look into Steps 3 through 5. The setting of Chicago is no accident. Toscas himself hails form the Chicago area, and selected Chicago to help establish the character of the opera. Audiences can expect to see local references and scenes, which should make their experience even more appealing. Opera newcomers should feel at home watching the action "in their backyard". "We approached Cathy Dunn, a long-time performer at the Chicago Lyric Opera, to be our Stage Director. We're very impressed with her tremendous character insight and passion for bringing out the humor in every work. 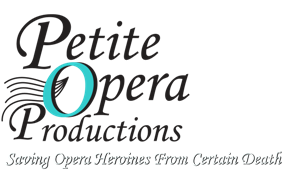 She makes outstanding use of the talents of emerging professional performers, as witnessed in our previous production at Petite Opera, including The Mikado, Cinderella (Massenet), and Hansel and Gretel," says Susan Baushke, Executive Director. Toscas, who directed the world premiere, thought it would be fabulous to see the level of dimension and comedy that a female stage director brings to the characters in this version, since the women turn the tables on the guys. the guys' attention from the secretarial pool office. frame walls with bold, geometric colors and shapes. "The creative team for this production has been tremendous to work with," says Cathy Dunn, Petite Opera Stage Director for Cosi fan tutte. "I really wanted a feel of the bold colors, geometric shapes and graphics of the times, as well as to accommodate numerous set changes to fit our petite stage. Our set designer, Dave Carmona, has created elegant pieces that transition from the El trains to the office setting, and office sections that divide the eye, yet not the action. 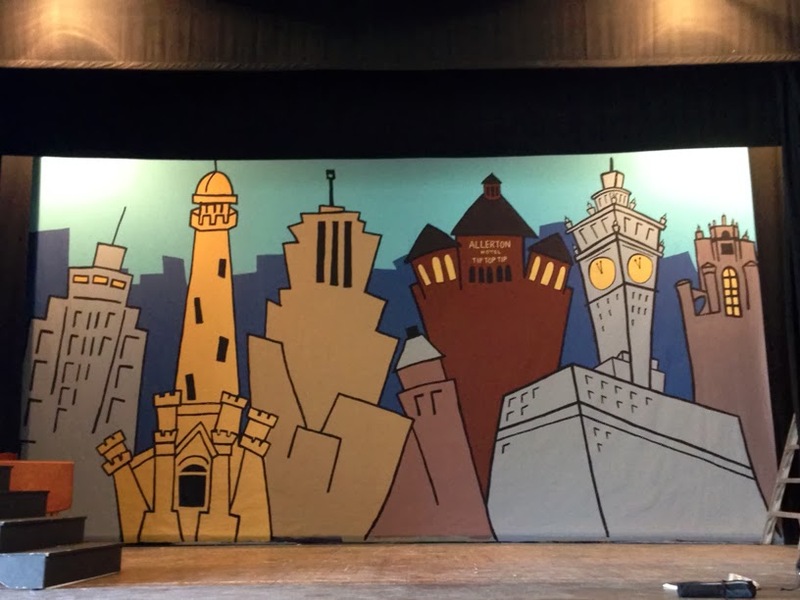 Likewise, our scenic backdrop designers, Kim Guzniczak and Christina Kakavas, have come up with a whimsical and comical period cityscape with a unique height perspective, taking you up to the higher floors of the advertising agency setting. It's miraculous the way this team has just gelled." 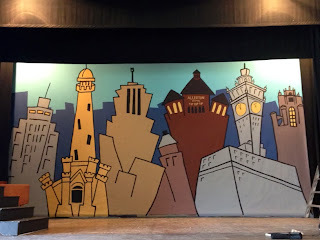 Guzniczak and Kakavas' whimsical Chicago skyline. Steve Arvanites, Director of Production, agrees. "This creative team just clicks. Every element has combined to bring Cathy's ultimate vision to life, and is executed with the utmost creativity." "Cosi is a true ensemble show, which makes it one of the most difficult to cast. All of the characters interact and change pairings during the course of the show, so how they look together, interact comically, blend musically... all of that has to be taking into consideration," explained Baushke. "The talent that auditioned for this show was tremendous. Needless to say, we had a very difficult time casting the show, but we're certain audiences will be delighted with all of our choices". Two casts will perform on alternating nights, so audiences can see the show multiple times, and enjoy different takes on the characters and comic delivery. Ms. Desi's help to pull off the bet.